Application and systems logs can help you understand what is happening inside your cluster. The logs are particularly useful for debugging problems and monitoring cluster activity. Most modern applications have some kind of logging mechanism; as such, most container engines are likewise designed to support some kind of logging. The easiest and most embraced logging method for containerized applications is to write to the standard output and standard error streams. However, the native functionality provided by a container engine or runtime is usually not enough for a complete logging solution. For example, if a container crashes, a pod is evicted, or a node dies, you’ll usually still want to access your application’s logs. As such, logs should have a separate storage and lifecycle independent of nodes, pods, or containers. This concept is called cluster-level-logging. Cluster-level logging requires a separate backend to store, analyze, and query logs. Kubernetes provides no native storage solution for log data, but you can integrate many existing logging solutions into your Kubernetes cluster. Cluster-level logging architectures are described in assumption that a logging backend is present inside or outside of your cluster. If you’re not interested in having cluster-level logging, you might still find the description of how logs are stored and handled on the node to be useful. In this section, you can see an example of basic logging in Kubernetes that outputs data to the standard output stream. This demonstration uses a pod specification with a container that writes some text to standard output once per second. You can use kubectl logs to retrieve logs from a previous instantiation of a container with --previous flag, in case the container has crashed. If your pod has multiple containers, you should specify which container’s logs you want to access by appending a container name to the command. See the kubectl logs documentation for more details. Everything a containerized application writes to stdout and stderr is handled and redirected somewhere by a container engine. For example, the Docker container engine redirects those two streams to a logging driver, which is configured in Kubernetes to write to a file in json format. Note: The Docker json logging driver treats each line as a separate message. When using the Docker logging driver, there is no direct support for multi-line messages. You need to handle multi-line messages at the logging agent level or higher. By default, if a container restarts, the kubelet keeps one terminated container with its logs. 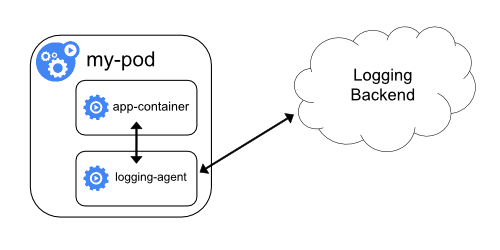 If a pod is evicted from the node, all corresponding containers are also evicted, along with their logs. An important consideration in node-level logging is implementing log rotation, so that logs don’t consume all available storage on the node. Kubernetes currently is not responsible for rotating logs, but rather a deployment tool should set up a solution to address that. For example, in Kubernetes clusters, deployed by the kube-up.sh script, there is a logrotate tool configured to run each hour. You can also set up a container runtime to rotate application’s logs automatically, e.g. by using Docker’s log-opt. In the kube-up.sh script, the latter approach is used for COS image on GCP, and the former approach is used in any other environment. In both cases, by default rotation is configured to take place when log file exceeds 10MB. As an example, you can find detailed information about how kube-up.sh sets up logging for COS image on GCP in the corresponding script. When you run kubectl logs as in the basic logging example, the kubelet on the node handles the request and reads directly from the log file, returning the contents in the response. Note: Currently, if some external system has performed the rotation, only the contents of the latest log file will be available through kubectl logs. E.g. if there’s a 10MB file, logrotate performs the rotation and there are two files, one 10MB in size and one empty, kubectl logs will return an empty response. The Kubernetes scheduler and kube-proxy run in a container. The kubelet and container runtime, for example Docker, do not run in containers. On machines with systemd, the kubelet and container runtime write to journald. If systemd is not present, they write to .log files in the /var/log directory. System components inside containers always write to the /var/log directory, bypassing the default logging mechanism. They use the glog logging library. You can find the conventions for logging severity for those components in the development docs on logging. Similarly to the container logs, system component logs in the /var/log directory should be rotated. In Kubernetes clusters brought up by the kube-up.sh script, those logs are configured to be rotated by the logrotate tool daily or once the size exceeds 100MB. Use a node-level logging agent that runs on every node. 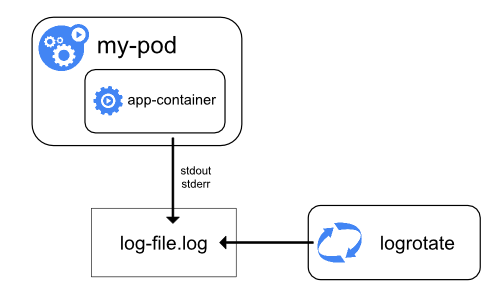 Include a dedicated sidecar container for logging in an application pod. Push logs directly to a backend from within an application. You can implement cluster-level logging by including a node-level logging agent on each node. The logging agent is a dedicated tool that exposes logs or pushes logs to a backend. Commonly, the logging agent is a container that has access to a directory with log files from all of the application containers on that node. Because the logging agent must run on every node, it’s common to implement it as either a DaemonSet replica, a manifest pod, or a dedicated native process on the node. However the latter two approaches are deprecated and highly discouraged. Using a node-level logging agent is the most common and encouraged approach for a Kubernetes cluster, because it creates only one agent per node, and it doesn’t require any changes to the applications running on the node. However, node-level logging only works for applications’ standard output and standard error. Kubernetes doesn’t specify a logging agent, but two optional logging agents are packaged with the Kubernetes release: Stackdriver Logging for use with Google Cloud Platform, and Elasticsearch. You can find more information and instructions in the dedicated documents. Both use fluentd with custom configuration as an agent on the node. The sidecar container streams application logs to its own stdout. 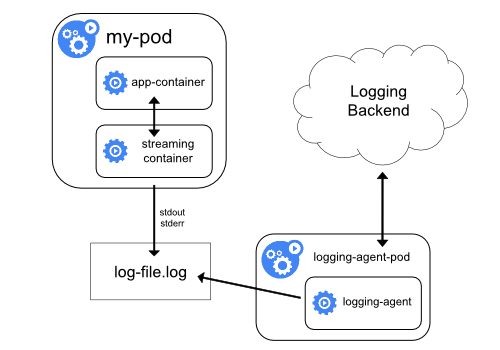 The sidecar container runs a logging agent, which is configured to pick up logs from an application container. By having your sidecar containers stream to their own stdout and stderr streams, you can take advantage of the kubelet and the logging agent that already run on each node. The sidecar containers read logs from a file, a socket, or the journald. Each individual sidecar container prints log to its own stdout or stderr stream. This approach allows you to separate several log streams from different parts of your application, some of which can lack support for writing to stdout or stderr. The logic behind redirecting logs is minimal, so it’s hardly a significant overhead. Additionally, because stdout and stderr are handled by the kubelet, you can use built-in tools like kubectl logs. It would be a mess to have log entries of different formats in the same log stream, even if you managed to redirect both components to the stdout stream of the container. Instead, you could introduce two sidecar containers. Each sidecar container could tail a particular log file from a shared volume and then redirect the logs to its own stdout stream. The node-level agent installed in your cluster picks up those log streams automatically without any further configuration. If you like, you can configure the agent to parse log lines depending on the source container. Note, that despite low CPU and memory usage (order of couple of millicores for cpu and order of several megabytes for memory), writing logs to a file and then streaming them to stdout can double disk usage. If you have an application that writes to a single file, it’s generally better to set /dev/stdout as destination rather than implementing the streaming sidecar container approach. Sidecar containers can also be used to rotate log files that cannot be rotated by the application itself. An example of this approach is a small container running logrotate periodically. However, it’s recommended to use stdout and stderr directly and leave rotation and retention policies to the kubelet. 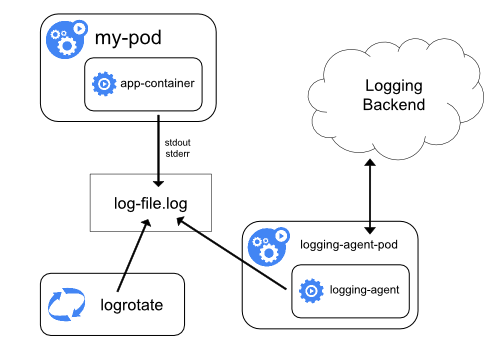 If the node-level logging agent is not flexible enough for your situation, you can create a sidecar container with a separate logging agent that you have configured specifically to run with your application. Note: Using a logging agent in a sidecar container can lead to significant resource consumption. Moreover, you won’t be able to access those logs using kubectl logs command, because they are not controlled by the kubelet. As an example, you could use Stackdriver, which uses fluentd as a logging agent. Here are two configuration files that you can use to implement this approach. The first file contains a ConfigMap to configure fluentd. Note: The configuration of fluentd is beyond the scope of this article. For information about configuring fluentd, see the official fluentd documentation. The second file describes a pod that has a sidecar container running fluentd. The pod mounts a volume where fluentd can pick up its configuration data. Remember, that this is just an example and you can actually replace fluentd with any logging agent, reading from any source inside an application container. You can implement cluster-level logging by exposing or pushing logs directly from every application; however, the implementation for such a logging mechanism is outside the scope of Kubernetes.